Wood-base composite panels including particleboard and fiberboard are widely used for many applications, such as underlayment for carpeting as core material, paneling, furniture and cabinet manufacture. The majority of particleboard panels is produced using 10 to 15 percent formaldehyde-based adhesives primarily urea formaldehyde (UF) as a binder for typical production. This fact sheet summarizes some of the main aspects of particleboard manufactured from Eastern redcedar using non-toxic modified starch as green binder. It is a known fact formaldehyde-based adhesives are considered as a dangerous substance due to formaldehyde emission and linked to health problems from both short- and long-term exposure. Therefore, there is a movement to find alternative green adhesives that eliminate formaldehyde emission from the panels. Modified starch is one such potential environmentally friendly binder. In a past study, experimental composite panels from whole-tree chipped redcedar were manufactured using UF adhesive, resulting in both satisfactory physical and mechanical properties. Since there is no or little information on properties of particleboard panels made from Eastern redcedar using modified starch, this study attempted to produce initial data on properties of such value-added panel products. When one considers the combination of this resource with a green-based adhesive, such invasive species can be converted into value-added panel products so an important ecological problem can be solved with an environmentally friendly approach. Commercially produced Eastern redcedar particles supplied by a local producer in Oklahoma were used to produce experimental panels. Dried particles having a moisture content of 3 percent were classified into fine and coarse sizes on a 20-mesh and 60-mesh screen, respectively. 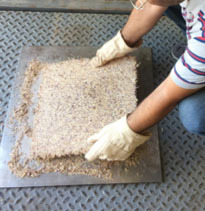 Coarse particles were used for the core layer of the three-layer particleboard, while the fine particles were used for the surface layers of the panel. Corn starch, along with glutardialdehyde (GDA) was mixed manually with the particles as binder for the panels. GDA is a colorless, oily liquid organic compound having the formula of CH2(CH2CHO)2, which is widely used as a disinfector agent for medical equipment. No wax or any other additives were used in production of the samples. The ratio of the surface layer thickness to the total thickness of a panel known as the shelling ratio was 0.30 for all specimens. Figures 1 and 2 illustrate the overall process of panel manufacture and untrimmed panel, respectively. Hand-formed mats were pressed in a computer-controlled press, an Erie Mill & Press Company Inc., 24-inch by 24-inch 270-ton press using a pressure of 5.5 MPa at a temperature of 180 degrees Celsius for 20 minutes. A total of 15 panels were made using each of the three density levels. Panels were conditioned in a conditioning room, having 65 percent relative humidity and a temperature of 20 degrees Celsius for two weeks before samples were cut for different tests based on American Society for Testing Material D1037-12. Figure 1. Flowchart of panel manufacture. The mechanical properties of the specimens, including bending strength and internal bond strength were carried out on a Comten Testing System, “Model 95-VD” equipped with 1000 kg load cell. Thickness swelling and water absorption tests were carried out on 100 mm by 100 mm by 12 mm size specimens by soaking in distilled water for 2 and 24 hours. Surface characteristics of 50 mm by 300 mm by 12 mm samples were evaluated by employing a fine stylus profilometer Hommel T-500 unit, having TkE model pick-up equipped with a skid type diamond stylus having 5 µm tip radius and a 90-degree tip angle. The samples also were examined using a scanning electron microscope, FEI Quanta 600 FEG scanning electron microscope with an EVEX X-ray microanalysis system. The standard testing method for determining formaldehyde levels from wood products using a desiccator, ASTM D5582-14 was employed to examine to measure formaldehyde emission. The formaldehyde levels of the samples were determined by collecting air-borne formaldehyde in a small distilled water reservoir within a closed desiccator. Figure 3. Dry and 24-h water soaked samples. Overall bending and internal bond strength of the samples were determined to be within the expected range as compared to those of typical commercially manufactured particleboard panels from other species. Modulus of elasticity and internal bond strength values of the samples ranged from 344,263 psi to 640.337 psi and 63 psi to 132 psi, respectively. Water absorption and thickness swelling of the panels were relatively high. Panels made with 0.80 g/cm3, 0.70 g/cm3 and 0.60 g/cm3 density levels had water absorption and values of 164 percent 160 percent and 153 percent, respectively. Corresponding thickness swelling values were 18 percent, 23 percent and 31 percent. Typical commercially manufactured particleboard would have within thickness swelling values of ranging from 8 to 10 percent as a result of a 24-hour water soaking test. The main reason of dimensional instability of the samples can be related to very large hyroscopicity of starch as well as not using any wax as additives in the samples. Figure 3 shows thickness swelling of dry and water soaked samples for comparison purpose. 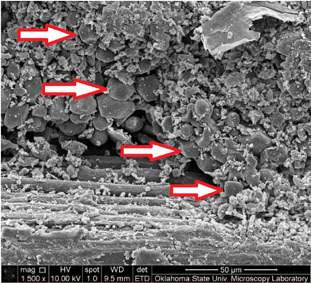 Also, nonhomogeneous mixture of starch, as illustrated in Figure 4 taken by scanning electron microscope, would result in low dimensional stability of the panels. Figure 4. Scanning electron microscope showing distribution of starch particulars in the panels. ASTM International 2014. ASTM D5582-14 Standard Test Method for Determining Formaldehyde Levels from Wood Products Using a Desiccator. Retrieved from https://doi.org/10.1520/D5582-14. ASTM International 2012. ASTM D1037-12 Standard Test Methods for Evaluating Properties of Wood-Base Fiber and Particle Panel Materials. Retrieved from https://doi.org/10.1520/D1037-12. Chotikhun, A., and S. Hiziroglu. 2017. Some properties of composite panels manufactured from Eastern redcedar (Juniperus virginiana L.) using modified starch as a green binder. Journal of Natural Fibers doi: 10.1080/15440478.2016.1240642. H`ng, P. S., S. H. Lee, Y. W. Loh, W. C. Lum, and B. H. Tan. 2011. Production of low formaldehyde emission particleboard by using new formulated formaldehyde based resin. Asian Journal of Scientific Research 4: 264-270. Hiziroglu, S., and R. Holcomb. 2005. Some of the properties of three-layer particleboard made from Eastern redcedar. Building and Environment 40:719-723. McKinley, D., and J. Blair. 2008. Woody plant encroachment by Juniperus virginiana in a mesic native grassland promotes rapid carbon and nitrogen accrual. Ecosystems 11: 454-468. Moubarik, A., H. R. Mansouri, A. Pizzi, A. Allal, F. Charrier, M. A. Badia, and B. Charrier. 2013. Evaluation of mechanical and physical properties of industrial particleboard bonded with a corn flour-urea formaldehyde adhesive. Composites: Part B 44: 48-51. Reddin, C. J., and D. C. Krementz. 2016. Small mammal communities in Eastern redcedar forest. The American Midland Naturalist 175(1): 113-119. Yang, Z., A. Kumar, R. L. Huhnke, M. Buser, and S. Capared. 2016. Pyrolysis of eastern redcedar: Distribution and characteristics of fast and slow pyrolysis products. Fuel 166: 157-165. Yu, L., X. Liu, E. Petinakis, K. Dean, and S. Bateman. 2013. Chapter 4: Starch Based Blends Composites and Nanocomposites. Advances in Natural Polymers, Composites and Nanocomposites. Springer. Heidelberg, New York. pp. 121-154.